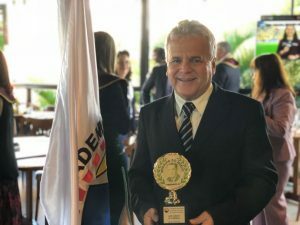 The director of New Acropolis Brazil North, Prof. Luis Carlos Marques Fonseca, was awarded the Medal of Legislative Merit President Juscelino Kubishek, granted by the International Academy of Culture. This distinction is a national recognition honoring the work carried out by New Acropolis in the areas of philosophy, culture and volunteering, which contribute to the formation of human beings and the promotion of dialogue, beyond differences. 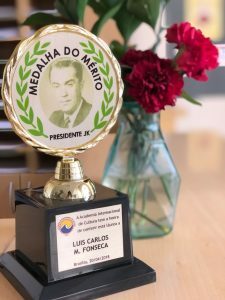 “For me it is very gratifying to see that our work is growing, that our dream of making a new and better world, of awakening in the hearts of human beings that which is a little asleep — goodness, justice and beauty — is growing… so that we can build, in a world where there is so much destruction”, said Luis Carlos. 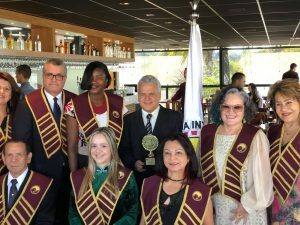 The Legislative Merit Medal is a tribute granted to authorities, personalities, institutions or national and foreign entities, which at a certain time in the history of the country, carried out work that had great impact and brought a significant contribution to the Brazilian people.